This year the Public Life Foundation of Owensboro asked Peirce, Johnson and their Citistates Group to return and prepare a new study that 1) reports on Owensboro’s progress since the 1991 Peirce Report and 2) lays out a fresh path to success for the community in the 21st century. Background on the new project, What’s Done, What’s Next: A Civic Pact, is available here. I was fortunate to be asked by Neal and Curtis to be the project’s lead researcher and writer. The project, which occurs from May to September, will produce a report in three chapters, each of which will be posted online. The findings of each chapter also will be made public in presentations at separate events in July, August, and September. I’m excited about the project because it is we an all-too-rare opportunity to 1) assess an American community during the first years of a new century and 2) suggest ways to succeed in era of challenge and change and competition unlike any it has faced. I’ve spent six days in Owensboro over the last month or so, and interviewed over a dozen people at length. Though my reporting is far from complete I’ve developed a clearer sense of what makes the community tick, and how it sets priorities and works to achieve them. Owensboro, very plainly, is no slouch when it comes to identifying and closing on big goals. To wit: Without making any judgment yet on its negative or positive features, the city and county in 2009 voted to approve a tax increase to raise public revenue for the riverfront redevelopment. That decision was made in the deepest recession in eight decades and amid a storm of voter disgust for tax increases. I’ve also begun to develop nascent conclusions about Owensboro’s weaknesses and how they could be overcome. It’s clear to me, for instance, that Owensboro’s residents, particularly young people, are not nearly as aware of the community’s many economic and cultural successes as they could or should be. There’s a pronounced civic grumpiness in Owensboro that is tied, no doubt, to the state and national economic downturn. But the all-too-common civic frown also incorporates deeper dimensions that seem entirely local. Too many young people, based on my conversations and the overwhelmingly negative comments about Owensboro that appear on newspaper and television comment sections and Facebook, see the city and region as a social and financial dead end. One result is that a good number of the region’s talented young people leave. One of the important goals in this project is to understand why that is happening in a region that is marketing itself so aggressively as a good place to live and do business. A second goal is to suggest ways to develop and apply a new formula of civic energy and engagement that holds people to their place in Owensboro. Given the community’s recognition of the need to add new assets, and its ability to raise money and actually develop those new features, something still appears to be missing? We need to discover what that is. 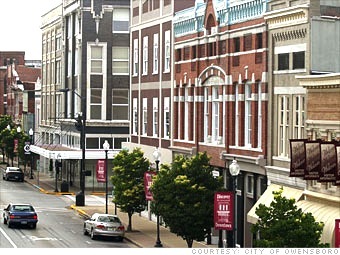 Why aren’t more people in Owensboro satisfied, even thrilled by where they live? Owensboro leaders I interviewed, and young people I met, say it is not enough for Owensboro to be a great place to raise a family and an even better place to retire. We want to help Owensboro identify what else is needed in the community’s success formula. And we want to suggest ways to strengthen how the region identifies and gains access to the new ingredients. I can speak only from my personal experience and situation, so here goes. I am 50 years old and, sadly, I must accept help from my retired, disabled mother to make my house payment each month. I did not overpurchase, my home was priced, ten years ago, at $44,900. I was, at that time, earning $27,000. annually; the monthly (actual) payment is only $311. but the insurance, held in escrow with the taxes, has more than doubled in these ten years, making the amount due $589. My health failed causing the loss of my job in 2002. My late grandparents’ estate allowed me to attend college during my recovery and complete my Bachelor’s Degree in Education five years ago. I was thrilled! I would be able to teach for many years and retire comfortably. A few months before my graduation, the state began cutting its own budget, teachers were being laid off and I’m still working at what had been my part-time college job, begging for hours and often not getting the hours I need to survive. I cannot declare bankruptcy as my only bills are: House, student loans, and living expenses (utilities, medication, etc.). I have applied for countless jobs. I am too old (you can tell by the interviewer’s expression when you walk in the door), overqualified, too specialized, whatever. I have applied for positions in my hometown and am beginning to lose hope. I have a wealth of practical experience and am well educated but no one here wants me. I fear that when my mother passes, I will have to pack up and start over elsewhere in order to work to my potential, provided it’s not time for me to retire! Owensboro has nothing to offer me and the only reason I stay is for the sake of my mother; she and I are the last of our immediate family and I cannot leave her with her current health issues. We have wonderful activities and venues: Theatre at the Riverpark Center (can’t afford it), lovely, unique shops (can’t afford them and it depresses me to window shop), restaurants galore (I can’t afford groceries so why eat out?). Owensboro is a wonderful place to live if one could find a decent job. So much of the area’s employment is minimum wage and there is little or no future in that. Had I gone to nursing school, I wouldn’t have any problems at all. I did not choose nursing school as I feel that should be a vocation, not a program to complete just to earn a living. Owensboro is and has always been a blue collar town. We had factories and a steel mill and only a few of those type jobs remain. At this late date, with no factory experience, I don’t see a future for me in the few remaining factories anyway. The educated youth haa no choice but to go elsewhere. There are no opportunities here, regardless of what you may hear. We are a small town, with small town politics; so much of what happens here is because of who you know. We are on a mission to bring the statue of Gabe Florella to downtown! Gabe was an icon back in our days. He built many things around our town and was a VERY BIG NAME! He is standing in a storage yard at the moment. His clothes are not painted the color they were back then and we are out to get that changed as well. He use to revolve as to be waving at anyone and everyone. A friend of mine has offered to paint Gabe at his own expense. He has been a painter for some thirty years or more. I/we would like to see him downtown to welcome all to that area. Let the ones who come here ask who he was and let the ones who know Gabe be able to tell them who he was and what he done for this town. We don’t care one least little bit about the big Bison near 9th and Frederica…….we do however care about Gabe!! I’ve known Owensboro for about 12 years and Kentucky for 25 years. The town certainly has not moved with the times. Access is terrible; poor airport and not even a greyhound bus depot. Many believe the city fathers deliberately held back progress to keep things the way they were for their own benefit. I worked for private industry in the late eighties and early nineties to set up medium size industry in rural Kentucky. Many of the towns had a modest plan to attract industries and the State had a “one stop shop” for State support. We selected Berea to buy fifties acres in their designated industrial park in 1988. There was support form the city, their “arch-enemy” the college, and the people. We invested $50m in a new and largest aluminum recycle plant in the world employing over 100 people in jobs that had good benefits. We were across the road from a much larger Japanese plant that has been very successful; then 2 or 3 other plant followed. When we arrived we got 3000 applicants for jobs; apparently today unemployment in the area is very low. We were a Canadian firm but what we found was that the Japanese had already discovered the benefits of setting up in Kentucky and they were building small plants in many towns to supply the auto industry. Getting a Toyota assembly plants in Georgetown and Rockport didn’t hurt. So the point is there were small towns with vision and a State that would support their applications, but where was Owensboro? Maybe they were just in the wrong place at the wrong time. Firms were looking for trainable labor in lost cost surroundings. Owensboro had labor that still remembered steel industry days. The lady who is bemoaning her plight because she doesn’t have money to enjoy the nice theater, shops and restaurants that Owensboro has is very typical. A generation grew up that had jobs and money and it became the norm and was taken for granted. When the jobs left (against Lou Dobbs advice) the banks and Wall street worked up schemes to keep spending going for while longer, and we know where that has taken us. There a enjoyable things in life that does not involve spending much money. Some problems and social behaviours have taken many years to develop and wont change over night. We have the Wallmarts, Home depots and fast food restaurants, but you cant buy satisfaction and happiness frequenting these places. Eating out, even if they cant afford it, has become the norm. What do they do with the time they save; watch more TV or dabble in Social media. Preparing meals and eating together is healthier for body, sole and family relationships. But where are the good food shops and farmers markets that are part of life’s pleasures for some communities. Ever been to Pike’s market in Seattle. Presumably such places would not survive in Owensboro and that’s a shame. What is good in Owensboro? Its great to have traditions like the BBQ festival and being able to take visitors to Moonlight or Old Hickory. The bike trail is fantastic. A trail built along Snake river between Spokane and Idaho proved to me that if you build it Americans will use it. Development of the Waterfront is crucial to good development in Owensboro; I wish them well on that project. Hopefully they will build high density residential complexes to give 24 hour a day life to the city. Do you like downtown Montreal or downtown Cleveland; yes I have worked in both places. I have step children that went to the High school on Fredica street. I was blown away by the immaculate upkeep of that school. The theater and a performance I saw there were excellent. Schools do appear to me to be the problem. However these very children are leaving town and headed to Lexington to work and study. But Lexington has a good airport (when they take off from the right runway), a university and they have attracted modern industries. It will be interesting to hear from your research what the people who live there really want the city to become. A journey of a thousand miles starts with a single step; lets hope they take a step in the right direction. Sorry Schools do not. repeat, do not appear to be a problem. Wind mills have been utilised by farmers to energy pumps to water their crops. Hi, just wanted to mention, I luked this post. It was inspiring.